In Mondo, players compete against each other while also racing against the clock. 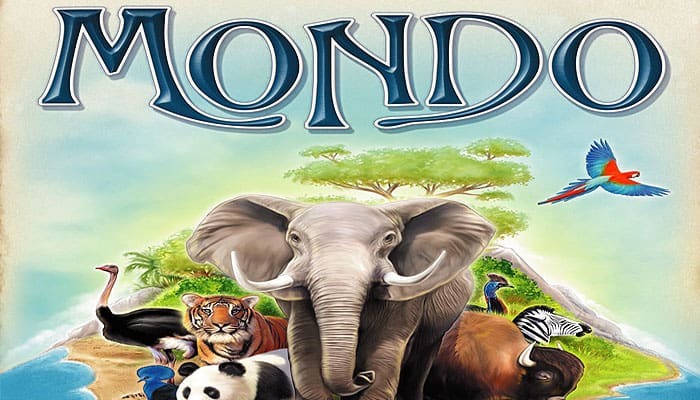 Each player has a small world board with empty spaces on it, and all players simultaneously pick tiles depicting different animals and environments from the middle of the table and place them on their world board, trying to create complete areas of the same environment. A new tile must be placed next to an already placed tile, but the environmental borders don't have to match. (These errors will earn negative points when the board is scored). When the timer runs out, players score bonus points for each animal and each completed environment and score negative points for volcanic tiles, empty fields on the world board and mismatched tiles (for example, a tile with a forest border connecting with a tile with a water border). 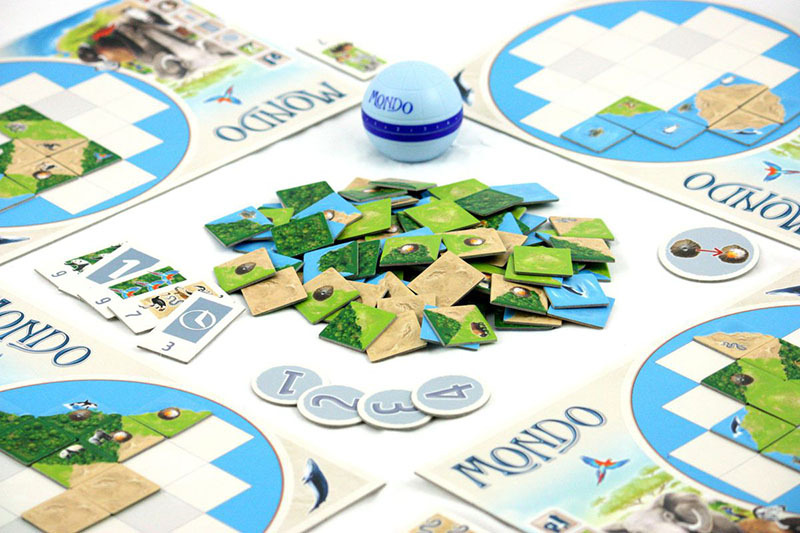 Mondo includes three degrees of difficulty, in addition to additional goals and ways to achieve (and lose) bonus points, as well as rules for solo play. Every player fashions his own world full of exotic animals and a variety of landscapes with the help of tiles and a board. While doing so, it's important to keep a sharp eye on the time and the other players, because everything happens simultaneously until the timer runs out. Whoever is able to jump out at the right time can reap a couple more bonus points. After three turns, the player who has collected the most points wins the game. Shuffle the 5 scoring modifiers and place them face down as a deck off to the side. Turn over the topmost scoring modifier and place it face up. Set the timer to 6 minutes at the beginning of every turn. The scoring modifier applies to all players: If one player is the best at fulfilling the scoring modifier, he receives 4 plus points. Shuffle the 12 additional tasks and place them face down off to the side. Turn over twice as many additional tasks as there are players, and place them face up within easy reach of all players. Example: In a three-player game, turn over 6 additional tasks. At the beginning of each turn, set the timer to 5 minutes. Before the game, look over the different tiles at your leisure. They depict 1, 2, or 3 landscapes in different combinations, but they do not contain all possible combinations! There is no tile with 4 landscapes. For each landscape type there are 4 different animals, which appear 4 times each. For all landscape tiles applies the following: On one side is always a holohedral landscape. If you get stuck, try advancing from another direction. The tile you're looking for may have been used by another player. The bonus chips and the score sheet are not needed; put them in the box. The volcano chip counts in solo play; place it next to your board. If particularly experienced players are at the table, you can ask them to take on this handicap to equalize play. You play without the volcano chip; instead, every handicapped player receives 1 minus point for every active volcano. The players without a handicap receive no minus points for volcanos. Inactive volcanos bring no minus points. You can increase the handicap further by making the inactive volcanos also carry 1 minus point each.